One thing I really enjoy about living in Scotland is seeing the Highland cows. 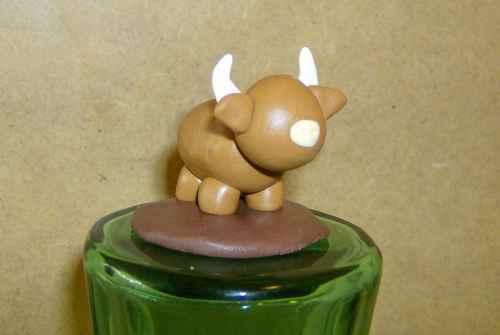 A few years ago I decided to challenge myself in making one out of polymer clay. 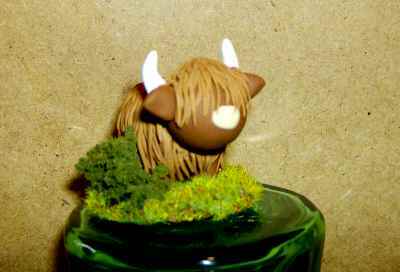 The completed Wee Moo (as I called him) was so adorable that I did a whole series of them and wrote a tutorial. 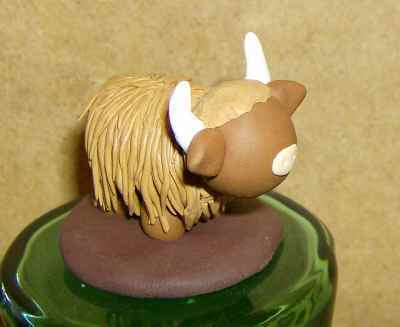 Below I will outline the process that I use to make podgy little shaggy Scottish Highland Cow figurines out of polymer clay. Polymer clay does not require a kiln to fire and can be heated in your home oven. It creates very little mess, comes in an entire rainbow of colours and unlike normal clay, it does not require slip to bind pieces together nor does it require time to dry before baking. The end result will not shatter like ceramic and is essentially a fairly sturdy plastic. Making a wee moo takes some patience (especially the first time) however; the finished product is outstandingly charming and well worth the effort. 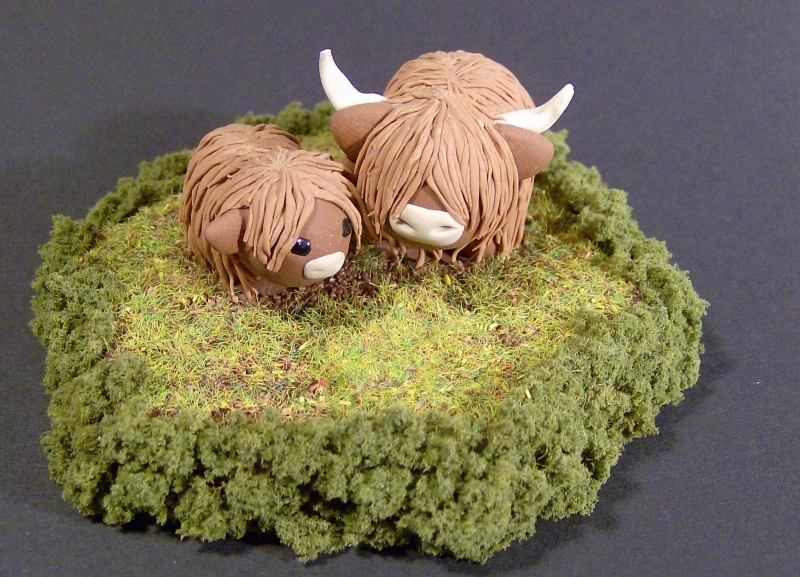 Of course, as with any tutorial there is also plenty of room for your own creative ideas to make your wee moo unique! First you need to set up your work surface. This is where that sheet of paper I listed in the materials comes in. The paper protects your desk because the oils and colors in polymer clay can sometimes be damaging and it will come in handy later for the fur. It’s best to tape the paper down as you will soon discover that though the clay is not necessarily sticky, it will still tug the paper all over the place and drive you crazy. (of course the sticky tape can also be damaging so just use some common sense here regarding your work area!) 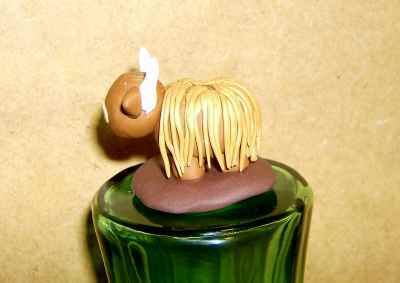 I prefer to do most of my work on the figure its self on an upside down drinking glass and strongly recommend this method. The whole thing sticks nicely to the bottom and it allows one to pick it up and hold it at a variety of angles which aids in the application of fur. 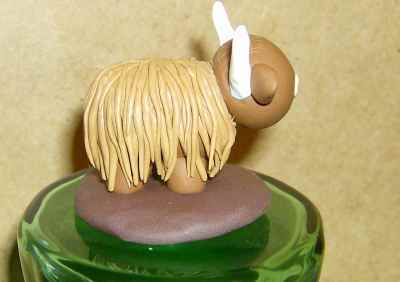 This particular figure at a bare minimum calls for 3 colours of polymer clay (white, flesh and caramel). The base of the figure can be any colour at all. I’ve used dark brown however, you can very easily use any of the 3 colours that you have already purchased because the base can be finished off and covered or painted with acrylic paint after the final baking. 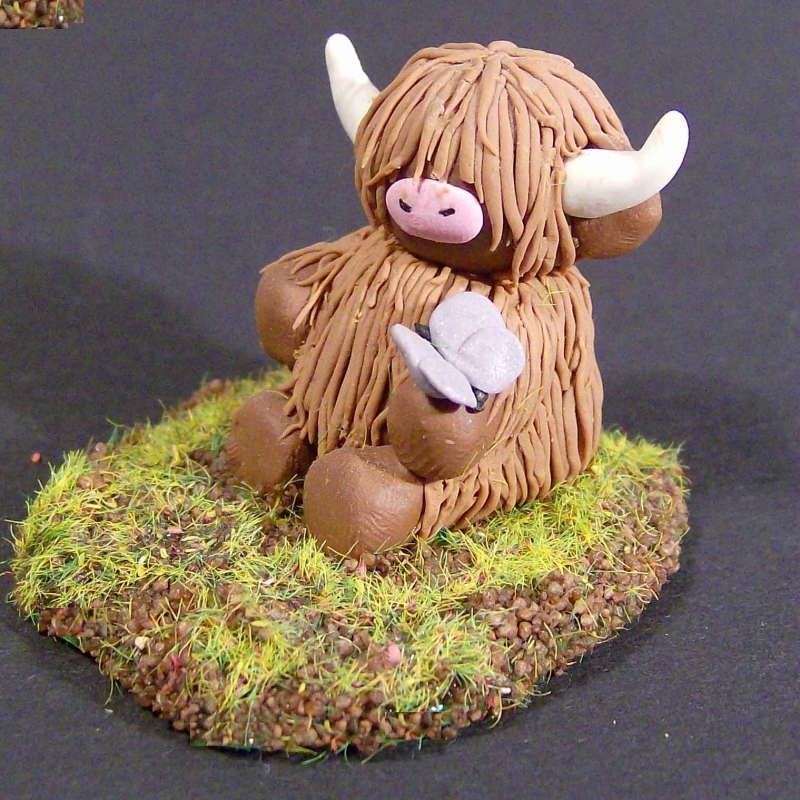 If you choose not to finish off the completed figure with model grass, gravel or acrylic paint then you should probably invest in a nice green or dark brown for your wee moo to stand on. Note: It’s not very important for the base to be even and symmetrical, just make sure it’s flat on the bottom and it’s all good. A little unevenness will add to the character of your finished piece! 2. Gently squish (larger) body ball into a SLIGHTLY oblong shape. 6. Fashion two symmetrical curved cones for horns. 7. Use the caramel to make two small fat wedges for ears. Assemble the body as pictured in the photo below. It is easiest to stick it all together in the following order. 3. Squash legs and body to base (gently, it will stick together with very little pressure). 4. Assemble face in the following order: ears, horns, nose. 6. Make two little indentations with the toothpick in the nose for nostrils (shaped like sideways mirrored tear drops -fat side out- as opposed to stabbed dots); alternatively you can draw these on after the final baking. Pry the base off of your work surface very carefully with either your craft knife or a flat razor blade. Bake wee moo for recommended time as per the instructions on the packet, remove from oven and allow to cool 10 mins. After the Moo has been baked the base will of course no longer stick to your work surface. This is easily fixed with either a blob of blue tack or a blob of spare clay. 1. Score the back of your moo along the spine and on the very top of the head with your craft knife. Don’t go crazy here, you just want to rough up the surface a little. 3. Start rolling thin snakes of fur to make a single layer curtain to go around your whole moo. Apply them as you roll them, no point in making more than a few in advance, they just start getting stuck to everything. Now your fingers are going to get a bit clumsy here so follow these simple rules in the application of fur. The area under the chin is the trickiest part but make sure you apply them now because it’s not easy to add these bits in later! Smooth the back with the toothpick where the overcoat fur is going to attach. The overcoat goes on a bit easier than the undercoat because there is plenty of unbaked clay for the strands to stick to. 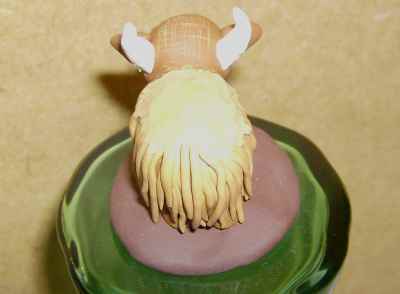 Repeat the process you used for the undercoat and add a second layer of varying lengths over the body of your moo filling in any gaps so that the body does not show through the fur. all strands should stem from the middle of the back. Remember, you want this to look a bit messy, shaggy cows aren’t exactly tidy! Also bear in mind that these strands will be quite delicate after they’re baked if they’re not fortified by other strands so try not to have too many free danglers! Make a thin cap of clay for the head to cover the area that you hatched in order to make a nice sticky surface for your head fur strands. Repeat the process that you used for the body (you’ll be an expert by now!!!) cascade the fur slightly over the back of the neck and around the ears/horns and give him a little do over his eyes and he’s finished! Bake for a further 10 mins, allow to cool and add any finishing touches. Don’t forget to sign and date the bottom with a permanent pen! Here is another one I did with a mommy and baby. These two photos are considerably nicer because I took them long after I wrote the initial tutorial with a better camera. And another with a butterfly on his hoof. The possibilities of polymer clay are really limitless so be as creative as you dare! Great creation! How long was the first bake? Thank you :) It’s been a long time since I have made one of these, but I would have gone by the package instructions, so probably 10-ish minutes as it wasn’t very thick. 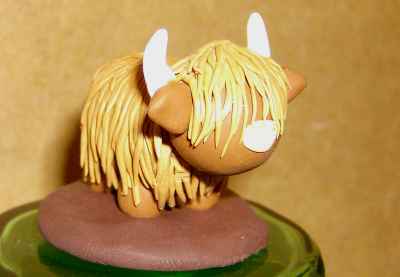 I love cows, especially highland cattle.This is udderly adorable. Nice job!